The Story: June Harper is in seventh grade band geek who loves to read and is missing her big sister Kate, who has just left for college. She is used to her parents's high expectations and strict rules that are meant to help her achieve her (their) goals. When her parents find a book that they do not approve of in June's possession, not only do they confront June, but they take their concerns to the PTSA, the principal of Dogwood Middle School and the school board. At home, they remove all of June's books from her bedroom library so that they can read, approve or remove and, in some shocking cases, edit the books, returning them to June's shelves with index cards glued over parts they deemed inappropriate, such as Anne giving Diana red currant wine from a bottle labeled Raspberry Cordial. Even worse, they have the middle school librarian, Ms. Bradshaw, removed from her position and they, along with concerned parents and SCAR, the Student Club for Appropriate Reading, confiscate and censor all the books in the middle school library. Any texts containing, "profanity, drugs, violence, rock/rap music, witchcraft, drinking, smoking, or rebellion of any kind are BANNED," and students caught with banned books will face "serious consequences." Stunned and bereft, June begins to form a plan when, walking to school along a different route one day, she encounters a Little Free Library where she discovers a copy of The Secret Horse of Briar Hill by Megan Shepherd (author of the upcoming YA book, Grim Lovelies, which will be reviewed here on October 1!) that she sneaks onto campus and reads secretly. Soon, she has turned the unused locker next to hers into a banned book library, covertly checking out books to her classmates. Becoming the Rebel Librarian, June jeopardizes a budding crush and alienates her best friend. But, she also makes new friends and finds a community that shares her passions and values. And, as every parent knows, the minute you tell a child s/he can't do something, that's all they want to do. Quickly, covert reading for pleasure becomes the hottest new fad at Dogwood Middle School. 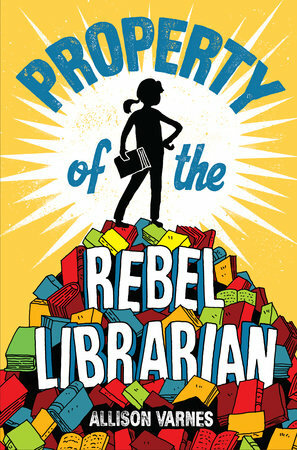 Which means that the Rebel Librarian's secret identity will not be secret for long. Why Read? Why Buy? : Property of the Rebel Librarian is a thrilling, nuanced read and I forced myself not to make it last over two nights instead of devouring it all at once. As an adult reader, I was very appreciative of the way Varnes handled the perspective of the censors. June's parents want only the best for their daughters and genuinely believe they are doing the right thing for June and, by extension, all the students at her school. I especially respected that Varnes made their censorious leanings about "tiger" or "helicopter" parenting rather than about religious beliefs which, while it would have been easy, would have been so tricky in a kid's book. Also, in doing this, Varnes makes the point that anyone can attempt to censor the rights of others for any reason. But seriously, as a book lover and librarian, I really enjoyed hating June's smug parents and reveled in her (and her sister's) rebelling against their insistence on controlling every aspect of their daughters's lives. Best of all, when June does declare her independence, she does it in a way that is directed specifically at her parents, nor does she ever express anger at her parents for their actions. Disbelief, sadness and disappointment, both for their actions and the fact that she truly does want to please her parents and make them proud. But, June realizes that she has to stand up and speak out for what she believes in and she does so in an articulate and meaningful way. Why read and why buy? Property of the Rebel Librarian is a great book for any kid who loves to read, especially those who have found community, connection and even refuge in books and/or a library. For kids who aren't quite as consumed by a love of books, there is kids rebelling against the rules of adults and a growing sense of suspense as the popularity of the library grows while the actions by the adults seeking to censor their children mount that will keep readers reading! And, while I don't want to give away the anything, I can tell you that Varnes had me in tears (kids will not get choked up, they rarely do) as June spoke the last lines of the book to her father. Property of the Rebel Librarian is a book I will think about often and never forget.